Crowdsourcing is the process of getting work done and finding solutions from the crowd of people outside your organization. It's usually done online in the form of open competition. The principle of crowdsourcing is that more heads are better than one! Crowdsourcing is embraced more and more often by the top brands all over the world to drive collaborative creation and reach consumers more effectively. Open Innovation is one of the most popular aspects of Crowdsourcing and allows people from all aspects of business such as investors, designers, inventors, and marketers to collaborate into a functional profit making reality. This is also a way to discover potential job candidates and engage high-to-reach tech influencers. What are major adventages of Crowdsourcing? The biggest benefit from using Crowdsourcing comes from the ability to receive better quality and more diverse solutions since many individuals & teams work simultaneously at the problem. In traditional outsourcing model you get solution from single provider. In Crowdsourcing model you may pick the best solution and talent you'd potentially like to cooperate with. The other thing is huge PR benefit that comes from engaging creative communities or consumers to work on your projects. That's an excellent way to raise brand loyalty and show that you listen and interact with consumers. Crowdsourcing can get your customers & potential customers immensely involved in your projects. Finally open competitions are great way for HR departments to spot "hidden talents". What are types and examples of crowdsourcing? -Idea challenge can foster innovation and bring in new fresh ideas for your projects. People love to step up and give their thoughts. Examples? Many Lego sets are in fact created by its fans. Lays run competition where they ask consumers to cook up original chip flavor. External crowd collaboration plays a key role in nearly 50% of P&G's projects! -Coding challenge are helping all sort of organizations including including businesses beyond tech sector (examples: McDonalds, Al Jazeera). This is because technology is continuously revolutionizing many different areas. Coding challenges are also excellent opportunity to promote your APIs or proprietary technology among developers community. - You can use power of the crowd to expand programming & design capacities of your organization. You may get a wider variety of MVP (minimum viable product) software prototypes before choosing final one to develop. It's a way to step up your application development game. - Finally you can use Crowdsourcing to test products and get feedback. Hackathon is competitive event where developers and people from related fields meet together and try to create something awesome within short span of time (typically 8-48 hours). Usually Hackathons revolve around some topic. Participants may form teams and work freely on their works or there may be specific challenge issued by Hackathon sponsor. Hackathons may have open form or be organized within organization to get people on high-energy environment. Relaxed and fun atmosphere is usually a part of it. Hackathons engage high-to-reach tech influencers and are breeding grounds for recruitment as they give opportunity to meet candidates as see how they work in real-life team projects under time pressure. They are unique chance for recruiters to spot "hidden talents", see them in actions and test both their hard and soft skills. Hackathons are 48h from ground-up to something amazing! Hackathon is meeting of minds to inspire each other trying to think out new solutions. What is the diffrences between Onsite hackathon and Online competition? In-person hackathon is as the name suggests an event you attend in person. In online competition works can be submitted online, typically during longer period of time. Aggressive time limit in a hackathon forces participants to pick key visionary concepts and turn them to actionable prototypes. Hackathons give opportunity to meet devs onsite whereas an online hackathon is something everone can participate in regardless of physical location. Who can run hackathon/online challenge? Anyone brave enough! Hackathons and online challenges are used more and more often by small startups and big well-established organizations all around the World. They are applied in various domains and industries. We're here to help you to throw out crowd against the problem! What are advantages of sponsoring hackathons? - First of all sponsoring Hackathon gives you a chance to meet new talents. Hackathons are really the new career fair for more and more industries. That holds particularly true for tech sector. Sponsors such as Microsoft, IBM, Intel, Rackspace, and other technology companies view hackathons as recruiting events. Kind of events where you actually get to interact with potential employees, can observe how they think and work. - Moreover you get general brand exposure. Often sponsors are given speaking rights for the event. As a speaker, you’ll be able to promote your brand, your message, and your product among creative communities of makers. - You get a chance to meet & talk to creative tech community which can result in their increased engagement with API/developer ecosystem. Hackathons give opportunity to build a long-term community around your brand. Imagine all people from your department or whole organization meet during weekend or drop what they're doing for a day and start building something new in a 12-hour marathon of creativity. Sounds crazy? That turns out to be very effective method for a great number of companies to provide grounds for new ideas. Hackathons can be good tools to stimulate the creative and problem-solving juices of your employees. In particular they make it much easier to try new things. In everyday jobs risk-taking may be frowned upon. Hackathon is a time to experiment with a low cost of failure. It's unprecedented opportunity to change the meaning of work. So are you brave enough to bring in Hackathon to your organization? What is the typical structure of the hackathon? It all starts with a challenge statement. Onsite Hackathons typically kick off with one or more presentations about the event, as well as about the specific subject that talents will tackle. Then teams are formed, they brainstorm on new ideas and work out prototype software solutions. Towards the end of the hackathon works are judged, to pick the most revolutionary one. Prizes are given. Such prizes may be some amount of money or investment in the winners idea. How ChallengeRocket can help to throw epic challenge? Crowdsourcing is like crude oil. We try to refine it into fuel for your organization. The success of all crowdsourcing initiatives relies on meeting two key objectives: sufficient participation and quality contribution. We help you on both fronts providing tools and giving you access to our community of talents. With ChallengeRocket you can employ a scalable crowd of software developers, IT specialists, and creative workers to create your content. 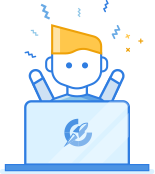 ChallengeRocket.com is an intuitive and responsive platform for organizing online challenges and hackathons. Our purpose is to connect the most talented and creative developers from all around the world. We help all makers to stand out and supports the implementation of the best IT ideas in business. Who can register on ChallengeRocket.com? Anyone! Whether you are in high school, college, or a working professional, if you are passionate about programming and are interested in building new technologies - we want you to be part of ChallengeRocket community! It is an event, in which a large number of people meet to engage in collaborative computer programming, typically to solve a given task. Hackathons provide a venue for self-expression and creativity through technology through collective task-solving. Usually, the most active and interesting solutions are awarded with technology-related prizes. What is the difference between onsite hackathon and online competition? In-person Hackathon is as the name suggests an event you attend in person. In online competition works can be submitted online, typically during longer period of time. Aggressive time limit in a Hackathon forces participants to pick key visionary concepts and turn them to actionable prototypes. Hackathons give opportunity to meet devs onsite whereas an online Hackathon is something everyone can participate in regardless of physical location. Why people go to hackathons? There are a number of reasons why people go to Hackathons, such as learning opportunities, opportunities to meet like-minded people, hunger for competition, free food, opportunities to get hired in the company sponsoring the event, chances of solving an awesome task and so on. Who typically goes to hackathons? Typically, Hackathons are attended by IT enthusiasts who are eager to learn and want to meet other like-minded people. Statistics show that around 30% of all Hackathon attendees are newbies, whereas 70% of attendees have already attended Hackathons once or twice before. How experienced should I be to attend hackathons? You do not necessarily have to be a pro in C++ to attend hackathons. All we expect is that you are completely in love with IT and you consider yourself a nerd. That’s good enough! What task can I expect to get? The tasks given can generally take shape in the form of websites, mobile apps, and robots, depending on the field of the company sponsoring the event.